This post was sponsored by Natural World. However all opinions are my own. I'm all about natural haircare, I've found it's just far better for your hair. So when the newly repackaged brand landed on my doorstep I was super excited. Natural World is a cruelty free brand that uses only natural products where possible. They use super food ingredients for hair! I've been testing the Moisture Rich range. Which uses Moroccan Argan oil as its key ingredients. 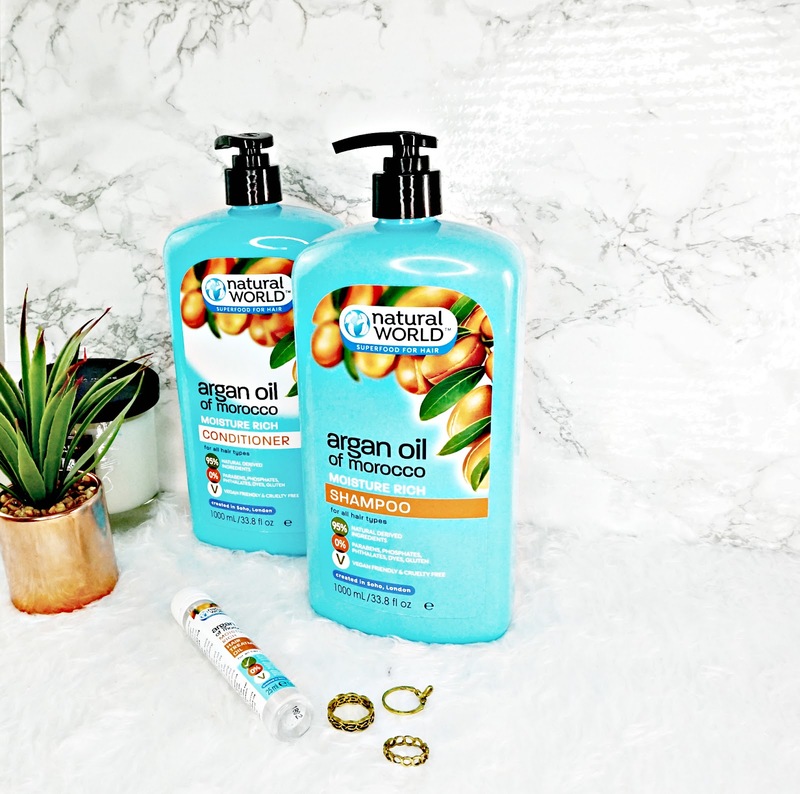 Argan oil really is a superfood for the hair; it's so hydrating and smoothing. The Moisture Rich range also doesn't contain Mineral oil or SLS and it's cruelty free and vegan. Here are my thoughts on the products. For reference I have dry, thick, curly hair that's prone to frizz. Now it's worth noting the shampoos and conditioner come in a whopping 1litre size! So for the price it's already amazing value for the money. I also love that the shampoo and conditioner come with a pump, making them so easy to use. The shampoo itself smells devine and feels really rich on the hair. It actually lathers really well considering it doesn't contain Cocamide (a foaming agent). It cleanses my hair really well without leaving it feeling dry or stripped. In terms hydration I don't find it overly hydrating but it's not stripping, And I do think it has helped the overall condition of my hair. I think this is great for the price. This conditioner is the star of the show. I'm so impressed with this. As I said earlier this contains Argan Oil which is so hydrating. The conditioner is really thick, which I love and it's deeply nourishing on the hair. I like to leave it for around 5 minutes for a deeply nourishing treatment. It's really easy to rinse from the hair and doesn't leave my hair feeling weighed down, but it still really hydrates the hair. My hair instantly feels softer. Once my hair's dried it feels so nice and has a healthy shine. My spilt ends are also soothed and my hair just looks overall better. This is a great affordable conditioner that really works. A good hair oil is essential for my haircare routine. And this offering from Natural World boosts a range of benefits. It adds shine, tames frizz, hydrates the hair and makes it easier to manage. This oil is so light weight, it doesn't feel like anything on the hair but the effects are amazing. I like to use it on wet and dry hair, the results are brilliant. My hair looks so much better than if I didn't use it. My only gripe with this is the packaging, it's kind of hard to control how much I'm tipping out the bottle. But because the product is so amazing I can over look it. This is one of the best affordable hair oils I've tried. I can't recommend it enough. Overall I'm really impressed with these Natural World goodies. If you're looking for great affordable haircare that really works. Look no further. Natural World is available from Tesco in stores and online here.